Did you know that we have public access defibrillators in 38 Scotmid Co-operative, Semichem and Lakes and Dales Co-operative stores? A defibrillator is a life-saving machine that gives the heart an electric shock to restart when someone is having a cardiac arrest. Acting quickly when someone is in cardiac arrest is crucially important – every minute without CPR and defibrillation reduces their survival by 10%. A defibrillator can increase the chance of survival by 50%. Scotmid Co-operative has been working with the Scottish Ambulance Service since 2011 to install public access defibrillators in the communities in Scotland that need them most. This includes remote communities where it may take longer for an ambulance to reach, places where there are high instances of cardiac arrest and areas of high footfall. 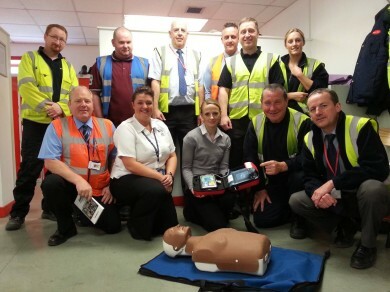 The Scottish Ambulance Service has also provided over 150 hours of training to Scotmid staff as part of the project. 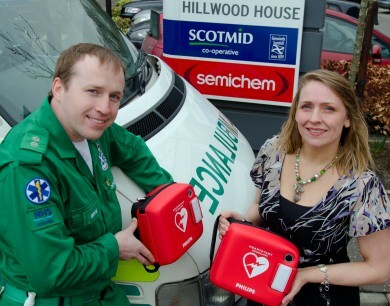 Scotmid Co-operative was the first UK retailer to put defibrillators in a large number of its stores. Plus there are two mobile defibs operated by our Crime Prevention Team.